MIDDLETOWN, Ohio — The River States Conference office announced Monday that Midway University Sports Information Director, Dylan Brown, has been named the River States Conference Sports Information Director of the Year for 2017-18. 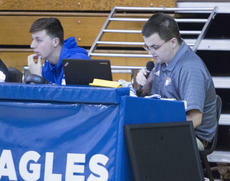 The RSC SID of the Year award annually recognizes one honoree for their dedication to sports information efforts in promotion of their campus, conference and the NAIA. 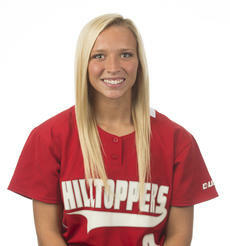 After a standout rookie season on The Hill, Western Kentucky University softball’s Jordan Thomas continues to make program history, becoming the Hilltoppers’ first freshman to ever earn National Fastpitch Coaches Association (NFCA) All-Region honors. The Lebanon native and Bethlehem High School graduate landed on the Mideast Region’s third team to become WKU’s ninth All-Region selection and first since the 2016 campaign. The Campbellsville community lost a dear friend on Sunday morning. Bobby Brockman, the longtime sports editor at the Central Kentucky News-Journal, passed away in his sleep at the age of 61. 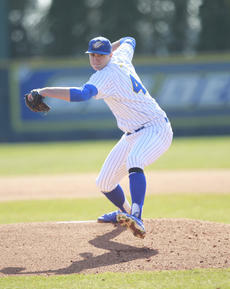 Jimi Keating produced a banner year for Spalding University during his junior season, being named one of the top pitchers in NCAA Division III baseball. But how that junior season ended, with six straight losses and a two-and-out result in the St. Louis Intercollegiate Athletic Conference tournament, has left a bad taste in the former Bethlehem star’s mouth, especially with him suffering losses in his final two outings of the year. St. Catharine College may have shut its doors more than two years ago, but the longtime presence of the Springfield school continues to pay dividends for local athletes. Midway soccer coach Tim Wolz, who headed the St. Catharine program for seven years, used his relationship with area coaches to sign a pair of local standouts for his fledgling program at the Woodford County school. All-Region performers James Caisse of Nelson County and Thomas Sidebottom of Bardstown signed letters of intent in separate ceremonies at their respective schools on Monday. Taylor Skrine has been a dependable stalwart for Nelson County girls’ soccer coach Mike Glass for years, anchoring the Cardinals’ back line. 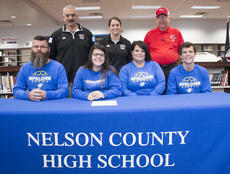 Skrine signed last week with Spalding University to continue her career at a ceremony at Nelson County High School. She’s looking forward to her next stop. It’s been a while since I did a column, and I’ve got a little housecleaning to do, so let’s play catch-up! 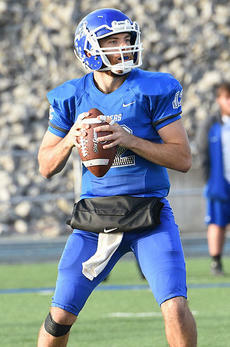 Local football products now playing in college are well-represented on the Mid-South Conference’s postseason awards list. For as far back as they can remember, Reece Puckett and Mikey Clements have been teammates on the baseball field. 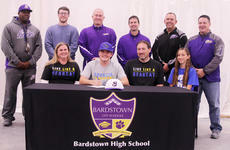 They have been together through the trials and tribulations of the sport, and, thus, it was only fitting the Bardstown seniors would share a moment of glory when they both signed letters of intent to play college baseball in front of family and friends at the old Salt River building on Templin Avenue last week. Two local athletes picked up conference awards for their recent hot play for their respective college teams, with former Bardstown standouts Keanu Young and Kindsay Miller-Riney being named their conference’s player of the week. 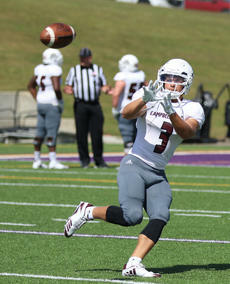 Young was the most recent, as the Campbellsville junior caught 11 passes for 200 yards, including a 54-yard scoring pass from Hunter Brown for the first points of the game in a 43-37 overtime win over Bethel, Tenn.
College basketball and football fans love to gnash their teeth about the NCAA and its lack of even-handedness when disciplining its member schools. Here in the Bluegrass State, the eternal impasse with North Carolina is a particular cause célèbre. There have been threats in recent years of schools making up the “Power Five” conferences (SEC, Pac-12, Big 12, Big Ten, ACC) splitting off and going their own way, so as to keep a bigger piece of the TV pie.